The National Weather Service issued an excessive heat warning through Wednesday as high temperatures are forecast to climb above 110 degrees. The haze and heat blanketing the Las Vegas Valley will last at least a couple more days. The National Weather Service issued an excessive heat warning beginning on Monday and extending through Wednesday as high temperatures are forecast to climb above 110 degrees. The warning means that the weather service expects “a prolonged period of dangerously hot temperatures” capable of causing heat exhaustion and heat stroke. Monday’s high in Las Vegas was 109. It was accompanied by haze created largely by wildfire smoke drifting into the valley from California, the weather service said. The heat also favors creation of ozone that combines with the smoke and adds to the shroud of smog. The weather service said the air will remain hot and hazy until smoke production decreases or the valley sees a shift in weather pattern, which is possible toward the end of the week. Tuesday’s forecast high is 112, and Wednesday should see a high near 110, the weather service said. Some cooling is expected Thursday, with a forecast high of 106. Lows for the week will stay near 87, the weather service said. 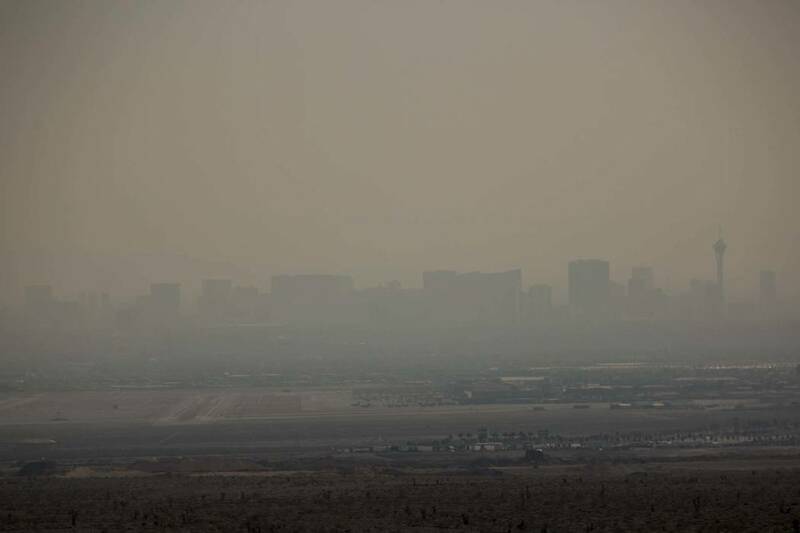 The Clark County Department of Air Quality also extended a smoke and ozone advisory through Wednesday. Smoke can irritate respiratory diseases and contribute to ozone, according to the county. Ozone exposure can cause coughing, wheezing and shortness of breath, the county said. Dr. Jeff Davidson, emergency department medical director at Valley Hospital in Las Vegas, said the hospital and its sister facility, Spring Valley Hospital, have seen a slight increase in patients with respiratory symptoms during the current haze-and-heat spell. Those 5 or younger, 65 or older and anyone with a chronic respiratory illness like asthma or bronchitis should stay indoors or limit time outside, Davidson said. Contact Max Michor at mmichor@reviewjournal.com or 702-383-6239. Follow @MaxMichor on Twitter. Review-Journal staff writers Blake Apgar and Jessie Bekker contributed to this report. The weather service recommends that residents drink plenty of fluids, stay in an air-conditioned room, stay out of the sun, and check up on relatives and neighbors during the hot spell. It also warns against leaving young children or pets unattended in vehicles, noting that interiors can reach lethal temperatures in a matter of minutes in such conditions.